Azmin Ali (second right); CIMB Group group chief executive officer Tengku Datuk Sri Zafrul Aziz (right), Munir (second left) and Professor Christopher Coker, director of LSE IDEAS at the launch of “China’s Belt and Road Initiative (BRI) and Southeast Asia” report in Kuala Lumpur on Tuesday. KUCHING: Asean and China must collaborate closely to ensure the success of the Belt and Road Initiative (BRI) in the region. CIMB Asean Research Institute (CARI) Chairman Tan Sri Dr Munir Majid emphasised this view in the panel discussion after the launch of a joint report by CARI and LSE IDEAS. 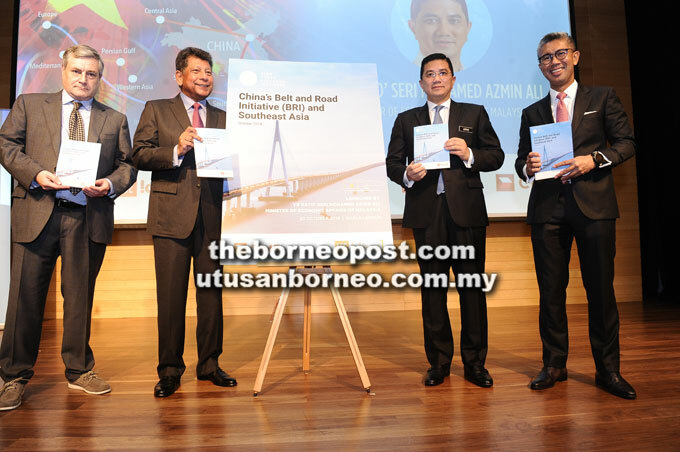 The report entitled, “China’s Belt and Road Initiative (BRI) and Southeast Asia” was launched by Malaysia’s Minister of Economic Affairs Datuk Seri Mohamed Azmin Ali on Tuesday. Munir proposed that a joint task force be established by Asean and China comprising official and private sector representatives to establish high-level guidelines on principles and practices in regional BRI projects whose detailed terms will be up to individual states to determine. This task force should also work to align the Master Plan for Asean Connectivity (MPAC) 2025 with the BRI so that regional infrastructure development takes place in an orderly manner without waste and costly white elephants. He noted: “Asean-China economic relations are extremely strong and well-founded. The trade and, increasingly, investment numbers speak for themselves. At the 21st Asean-China Summit in Singapore next month, the Asean-China Strategic Partnership Vision 2030 will be adopted which will further cement the close economic relations first formalised in Bali in 2003 when China became Asean’s first dialogue partner to have a strategic partnership. The CARI chairman observed that the five guiding principles of MPAC 2025 – sustainable infrastructure, digital innovation, seamless logistics, regulatory excellence and people mobility – could be brought to the highly imaginative BRI in the process of lifting the region to a new level of infrastructure development. Sustainable infrastructure, for instance,Munir noted, seeks to coordinate existing resources to deliver support across the full life cycle of infrastructure projects, including project preparation, infrastructure productivity and capability building. Taking another example, regulatory excellence points to good regulatory practice in the preparation, adoption and implementation of rules, regulations and procedures in the region through standards harmonisation, mutual recognition and technical regulations. Pointing to more specific situations, Munir identified Singapore’s MOU with China signed in Beijing last April to promote greater collaboration between Singapore and Chinese companies in third-party markets under the BRI. In this arrangement, a joint working group is to be formed to identify sectors and markets of mutual interest, and to organise business matching activities and forums to facilitate third-party market cooperation. As a former envoy to China, Majid acknowledged that Asean relations with China are asymmetrical and complex, thus, the bloc needs to identify and consolidate its common core interests and concerns as the basis of negotiations with China. “Asean should be encouraged to develop such a strategy. Individual Asean member states also need stronger leadership, effective regulatory mechanism and processes, to protect its sovereignty while pursuing the economic benefits, said Majid.